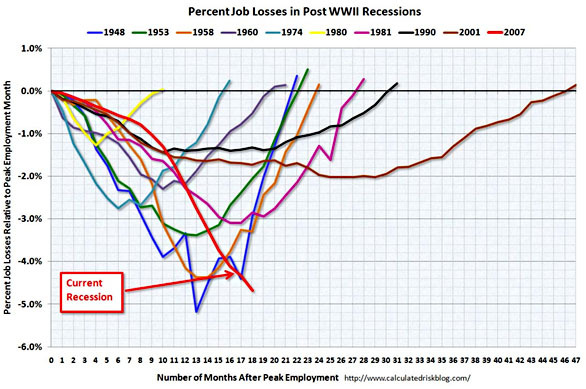 From Calculated Risk, here’s a chart incorporating today’s bad unemployment news. We’re now clearly in the worst slump since the Great Depression, and by far the worst slump in the past 50 years. And if that’s still not bad enough news for you, keep in mind that we’re in good shape compared to Europe and China. If and when another shoe drops (ARM resets? Eastern European defaults? a big bank collapse? an oil price spike? ), it could be 2008 all over again. On the bright side, the Wall Street Journal reports that banker pay has rebounded and is now back up to bubblicious 2007 levels. It’s good to see that not everyone is suffering.